When a group of anti-abortion protesters brandishing graphic posters gathered outside Jennifer Bundock’s vegan pizza shop, she knew what she had to do. 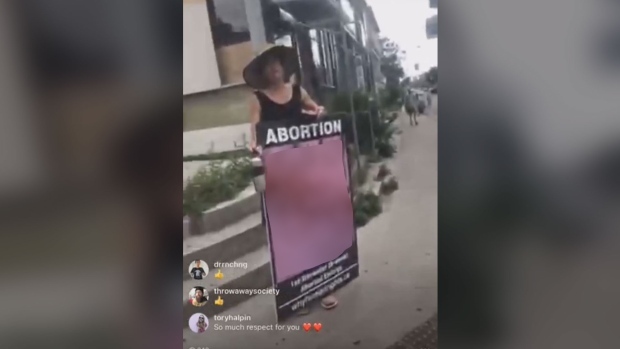 In an expletive-laden video that has been shared more than 3,000 times on Facebook, Bundock films her angry encounter with those holding the signs, eventually forcing them to leave the block. Bundock, 34, is a feminist activist and the owner of the small vegan pizza chain Apiecalypse Now! She’s no stranger to activism, having participated in protests and demonstrations in support of animal rights, immigration rights and women’s rights. So when she was warned about the protesters by her staff, Bundock took out her phone and started live-streaming on Instagram. “My objective in those situations is to make the people standing there as uncomfortable as they’ve made me,” she told CTVNews.ca, referring to the dramatic signs that she said can be “re-traumatizing” for people who’ve had abortions. Her yelling distracts people from the signage, she said. In the six-minute clip, the group walks across the street away from her business doors as she yells at them about what she said is their lack of knowledge about what women who have unwanted pregnancies need. “You don’t want people to get pregnant but you’re not handing out condoms?” she asks one of the men. In an emailed statement to CTVNews.ca, a representative for the Canadian Centre for Bio-Ethical Reform (CCBR), whose staff and volunteers are often seen with the disturbing signs, supported the group’s response to Bundock. The methods of the group, which has offices around the country, have offended more than Bundock. Earlier this month, Toronto city councilor Paula Fletcher posted a letter to the CCBR on Twitter that addressed a motion passed to have the group stop using graphic imagery in their literature. Bundock believes she is acting on behalf of women who feel they can’t confront pro-life activists themselves. “I know that the pictures on their signs are not there to expose the truth, as they say. The truth is nobody walks cheerfully into that appointment and nobody walks cheerfully out of it,” said Bundock. After the incident, Bundock said women came into her pizza shop to thank her. Now the thanks are coming from comments on the Facebook post and messages sent to her on Twitter. “I guess I’m never getting pizza anywhere else,” wrote Canadian author Zoe Whittall. Bundock said she feels a kind of “unique duty” to women who have had abortions. “So many of them can’t speak about it without it being too real and too close. It is worth it to me to defend other people’s right to those services and the autonomy over their body,” she said. And her loud, aggressive approach is just what she thinks is needed. 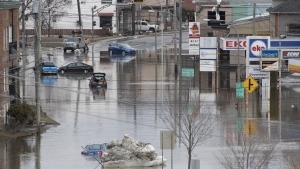 In this 2012 photo, Apiecalypse Now! 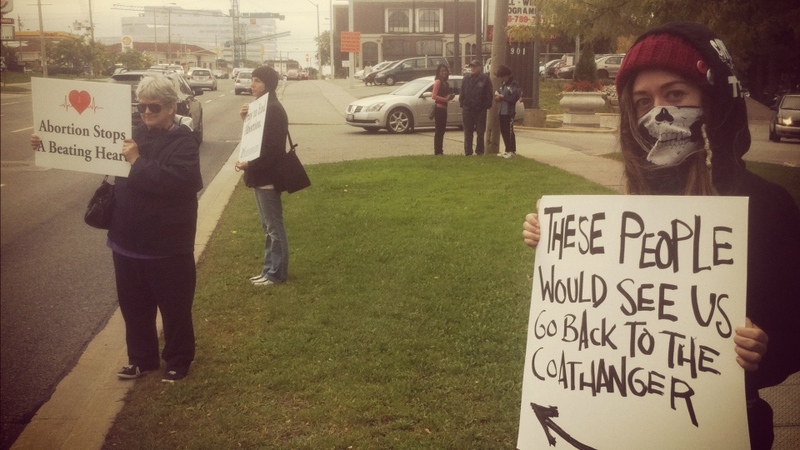 owner Jennifer Bundock, right, is seen next to an anti-abortion protester during a counter-protest in Toronto.